Did you suffer severe injuries or was your loved one killed in a motor vehicle accident caused by a distracted driver in Alabama? Drivers who cause crashes because they were distracted are typically considered negligent and may be liable for the damages that their accidents cause. Some motorists may have been visibly distracted, but many accidents occur so suddenly that victims do not even see the vehicles that strike them. Evidence of certain kinds of distractions may be obtained after accidents easier than others. Farris, Riley & Pitt, LLP has been handling all types of car crashes for more than 20 years. Our Birmingham distracted driving accident lawyers have the necessary experience to uncover driver distractions and make sure these negligent motorists are held accountable. Do not think that you cannot prove that another driver was distracted or that you must bear all of the costs of recovery on your own. Call (205) 324-1212 or fill out an online contact form to have our attorneys provide a complete evaluation of your case during a free consultation. Why Do I Need a Distracted Driving Accident Lawyer? You may know that another driver was distracted and at fault for your car wreck, but that does not mean the insurance company for the negligent driver is going to be willing to admit the same. In many cases, insurers will immediately argue that victims themselves were responsible for their accidents. Insurance companies use numerous tactics to accomplish their goals, which is the primary reason that any victim injured in a distracted driving crash will want to have legal representation. An attorney can handle all phone conversations with insurers, so you do not say anything that inadvertently hurts your case. Some insurance companies may offer victims lump-sum settlements to resolve their cases. These settlements are usually much less than what victims are entitled to, and people who agree to them quickly learn that the amounts are not enough to cover many of the future costs of treatment or rehabilitation that have to be paid out of pocket by victims. Farris, Riley & Pitt, LLP will immediately commence an independent investigation of your crash scene to collect vital evidence that proves the other driver was distracted. We can then negotiate for a fair and full settlement for your case, and our firm will file a lawsuit to try your case in court if an insurance company does not make a satisfactory offer. Farris, Riley & Pitt, LLP has secured many multi-million-dollar verdicts and settlements. Our team fights for those who have been hurt in Alabama, and we get results. Kirby Farris and Ken Riley are both Birmingham residents born and raised in Alabama. Mr. Farris was born and raised in Lynn, earned his undergraduate degree from the University of North Alabama, and obtained his law degree from Birmingham School of Law. Mr. Riley is a native of Alexander City who received his business degree from the University of Alabama and juris doctor from the Cumberland School of Law at Samford University. 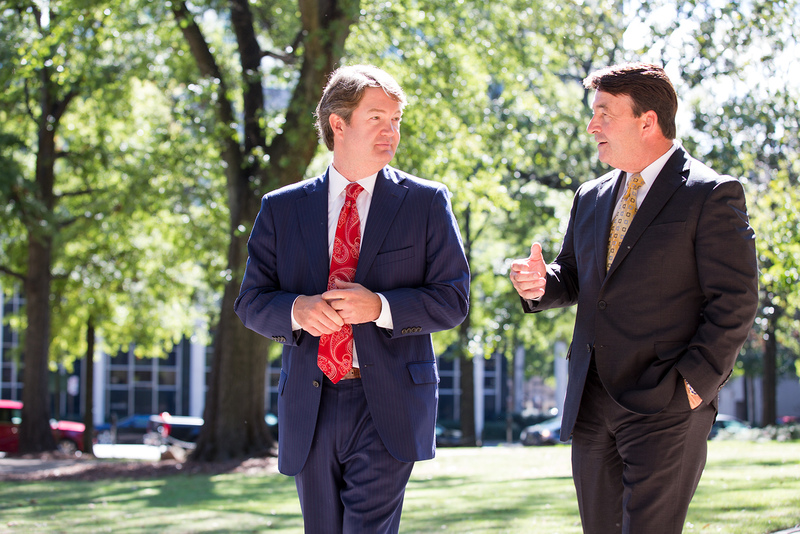 Mr. Farris and Mr. Riley are members of the American Bar Association, Alabama Bar Association, and Birmingham Bar Association. They are also both admitted to the United States District Court for the Northern District of Alabama, United States District Court for the Middle District of Alabama, and United States District Court for the Southern District of Alabama as well as the Alabama Supreme Court. You should also know that Farris, Riley & Pitt, LLP represents clients on a contingency fee basis. This means that when you work with our firm, you pay nothing unless you receive a monetary award. The most common kind of distraction responsible for an increasing number of car crashes nationwide relates to drivers attempting to use cell phones. Whether they are talking, text messaging, or performing other tasks on their devices, smartphones are a significant reason that many drivers take their eyes off the road and invariably cause collisions. Many negligent drivers admit to being distracted immediately after accidents, usually as a way of saying that they do not intend to cause the collisions. Victims should be sure to make a note of these admissions and the specific type of distraction that a negligent driver admits to, as the insurance companies for such drivers may very well likely deny or minimize these actions. Contributory negligence is an affirmative defense that a defendant can use to bar recovery of damages by a victim. Alabama is one of only five states in the nation that still recognizes contributory negligence, and the doctrine essentially means that a person who was negligent in any way (even if they were only 1 percent at fault compared to a defendant’s 99 percent of fault) cannot recover anything from a defendant. In other words, a distracted driver will not be liable for damages if the victim was at fault in any way for an accident. Insurance companies will immediately seek any possible way to exercise a contributory negligence defense, which is precisely why you should not speak to any insurer until you have legal representation. What should I do if I was involved in a distracted driving accident? Your first action following any motor vehicle accident should be to seek medical care. A hospital visit is important not only for ensuring you did not suffer an injury involving delayed symptoms, but it also creates an immediate medical record proving that you sought the proper care for your injuries. Victims should also take several pictures of their crash scenes from different distances and angles and obtain the names and phone numbers of all people who saw their accidents. Contact Farris, Riley & Pitt, LLP as soon as possible after a distracted driving crash, as our firm can quickly take the necessary steps for preserving your injury claim. We can subpoena a negligent driver’s phone records, and evidence of phone activity during the time of an accident can be used to demonstrate negligence. How long do I have to file a distracted driving lawsuit? Alabama state law establishes a statute of limitations of two years for filing injury claims. One exception to the statute of limitations concerns victims who are minors. In such cases, a minor can file a claim up to two years after the date of their 19th birthday. Distracted Driving Accidents: How Frequently Do They Occur? The University of Alabama reported that the number of reported crash cases caused by distracted driving increased by nearly 20 percent in 2016 over 2014. According to the Alabama Department of Transportation (ALDOT), more than 90 percent of crashes are caused by “driver error, lack of knowledge, inattention, physical or mental condition, improper attitude or faulty judgment,” and texting drivers are 23 times more likely to get into crashes than non-texting drivers. ALDOT also reported that 25 percent of teenagers respond to text messages once or more while driving. According to an analysis of distracted driving in Alabama conducted by the Center for Advanced Public Safety at the University of Alabama, distracted-affected drivers (a term used by the National Highway Traffic Safety Administration [NHTSA]) were a factor in 10 percent of fatal crashes, 15 percent of injury crashes, and 14 percent of overall crashes in 2015. That same year, 3,477 people were killed, including 551 non-occupants, and 391,000 people suffered non-fatal injuries in distracted driving crashes. The Center for Advanced Public Safety analysis also reported that 476 fatalities nationally were attributed to distractions from electronic devices specifically. This translates to 14 percent of all distractions and accounts for 16 fatalities a year in Alabama. According to the analysis, the 74 distractions from electronic devices during the five year period between 2012 and 2016 resulted in 78 fatalities. The analysis also found that drivers between 16 and 29 years of age were over-represented in distractions from electronic device data, and crash data showed men accounted for 56.84 percent of these accidents compared to 43.16 percent for women. The analysis also reported that 78.91 percent of these crashes occur less than 25 miles from a person’s home while 21.09 percent occur more than 25 miles from home. From 2012 to 2016, the Center for Advanced Public Safety analysis found that 127,816 crashes involving distractions from electronic devices occurred in Jefferson County, representing 14.37 percent of all crashes in Alabama. If you suffered severe injuries or your loved one was killed in a motor vehicle accident caused by a distracted driver, make sure that you quickly retain legal counsel. Farris, Riley & Pitt, LLP helps distracted driving crash victims in communities throughout Alabama. Our firm will fight to make sure that you recover every last dollar of compensation you need and deserve. You can have our lawyers review your case and discuss all of your legal options when you call (205) 324-1212 or contact us online to receive a free consultation.